They chose Kevin Connolly of Eurotech Homes as the builder. There was an existing home on the property, but it didn’t work with what they had in mind, so they started fresh while working on the same footprint. The incline of the lot provided some challenges, but nothing the architect and builder couldn’t overcome. The “soft modern” moniker given to this home is one you may not see in a lot of home magazines. It strikes a balance between being contemporary without being minimalistic or cold. “We wanted a warm and inviting home, and I think that is what we got,” the homeowner notes. the public agreed as this home was recently awarded the people’s choice for best overall house of the year in 2018. One look at this distinctive home makes it easy to see why they chose AZD. The facade is a mixture of cedar stained in a rich cappuccino color, metal, glass and Fond du Lac cut stone for a contrast of white. The stunning style elements are repeated throughout the interior as well. The proportions weren’t something measured out, at least not for Akey. While creating the design, they reworked and finessed it several times until it looked right. To know how much brick, glass and wood to use so the dimensions are ideal requires the eye of a good architect. The canopy over the front porch that extends to the interior is a unique AZD touch, as it is the low slope of the roofline. This three-bedroom, five-bath house sits perched on a hill overlooking a lake and is designed to take advantage of the views. The lake side is almost all windows. What keeps it structurally sound? “There was a lot of steel,” the homeowner chuckles. There is an open stairway to the walk-out lower level. They wanted an informal, unfussy home that would be cozy enough for a family of four but expansive enough for a party of 30. Lynda Charfoos of Charfoos Design made it happen with intimate seating areas for the family and auxiliary seating around, including built-in bench seating on the fireplace. The kitchen, while beautiful, is first a place to cool and entertain. It’s a favorite of Charfoos. The dramatic dark stone slab on the island, infused with white, strikes just the right balance between modern and warm. The dark cabinets and stainless appliances give a simple, clean-lined look. 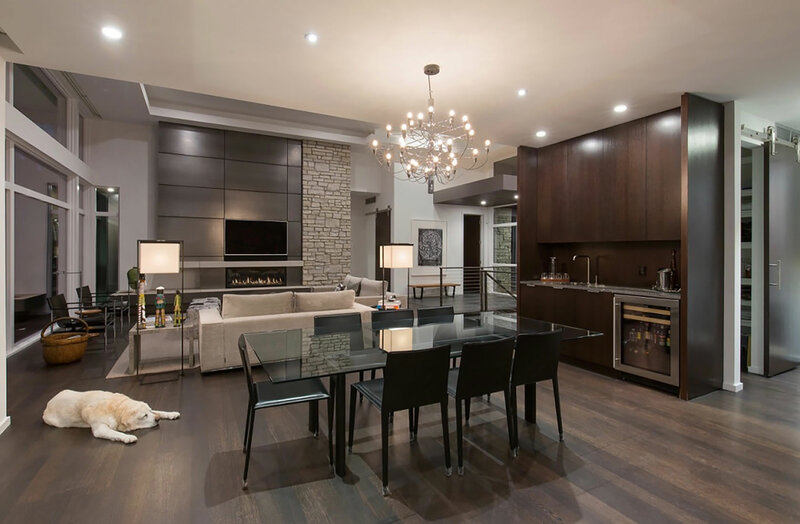 The space moves seamlessly in the open floor plan to the dining room, where they chose a glass dining room table, again repeating details for a stunning, cohesive overall impression. The fireplace has horizontal panels of cold-rolled steel that absorb and reflect the glow of the fire. The Fond du Lac stone down one side echoes the front entry; it’s one of Akey’s favorite features in the home. The furniture is comfortable and simple. There is a balance and a rhythm to this home that you don’t find everywhere; its a real credit to the team.